At the end of my first visit to Sentosa Island in Singapore, I went up in the Tiger Sky Tower ride. I love seeing the places I visit from above, and this gave me a nice, bird’s-eye view of the area. The top photo is the view out over Siloso Beach and beyond into the South China Sea, complete with numerous container ships and other water traffic. 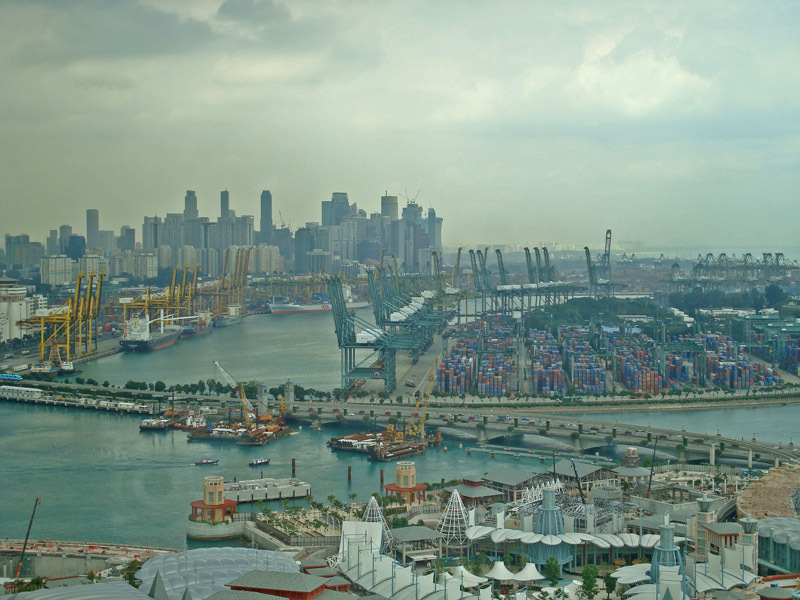 And the view pictured above is the destination of all that water traffic—Singapore’s busy port—and just beyond that, you can see the modern, industrial city center. I like all the interesting juxtapositions you find in Singapore—a busy shipping lane just beyond a tranquil beach, an old place of worship next to a modern high-rise building and a peaceful park just behind a crowded shopping center, just to name a few. In a country so small and urban, I guess that’s what inevitably happens. 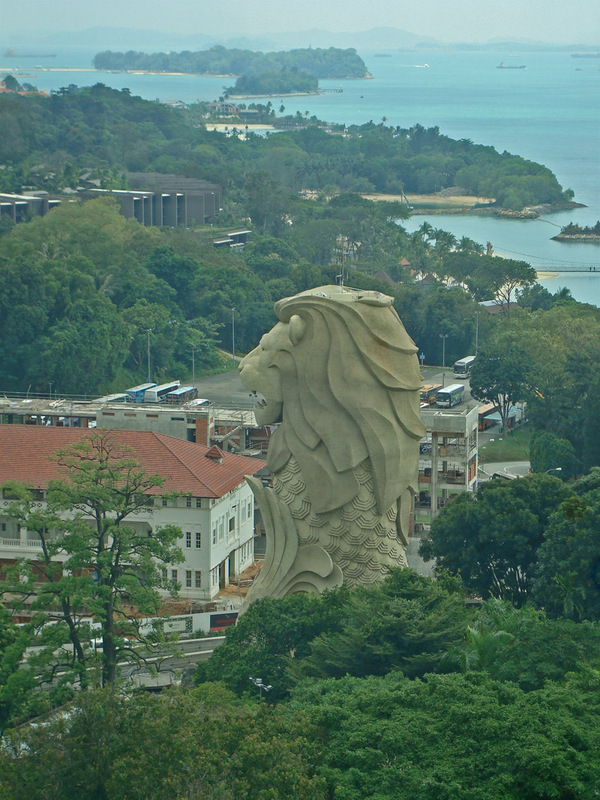 This last photo (above) shows the country’s largest statue of a Merlion on Sentosa Island. (There are five official statues of merlions around the country.) The Merlion is a mythical creature with the body of a fish (thus, the “mer,” meaning the sea) and the head of a lion, and it has been the symbol of Singapore since the 1960s. The fish is meant to represent Singapore’s ancient name, Temasek, which means “sea town” in Javanese, and the lion’s head represents Singapore’s more modern name, Singapura, which means “lion city” in Malay. 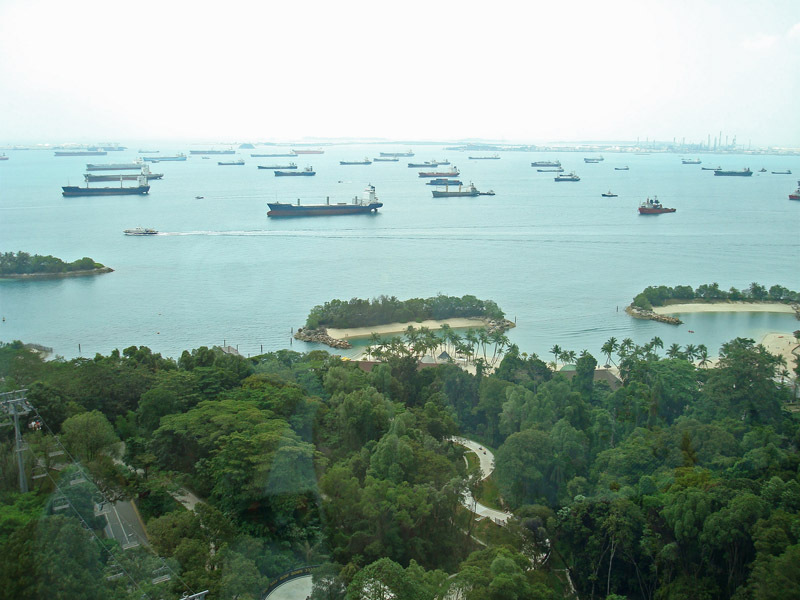 I took these photos from the Tiger Sky Tower on Sentosa Island in Singapore in February 2010. 20 Mar This entry was written by Kathy Keating, posted on March 20, 2010 at 8:46 am, filed under Animals, Asia and tagged Animals, kathy keating, sentosa island, siloso beach, singapore, water. Bookmark the permalink. Follow any comments here with the RSS feed for this post. Both comments and trackbacks are currently closed.